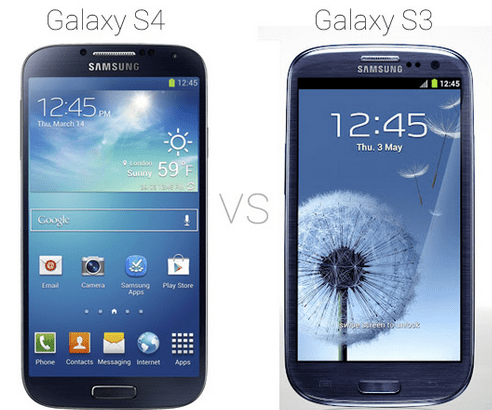 Samsung Galaxy S4 is the successor of the popular Galaxy S3 which had a 4.8 inch display which has evolved into a 5 inch Full HD Super AMOLED capacitive touchscreen with 1080×1920 pixels compared to the S3 with 720 x 1280 pixels and 4.8 inches. Samsung has cleverly increased the Screen size to 5 inches from 4.8 inches but decreased the Phone size in thickness and width of the phone. Samsung Galaxy S4 is available with a processor of either 1.6 GHz octa-core Samsung Exynos 5 processor or the 1.9 GHz Snapdragon Fusion Pro quad-core processor. It has a RAM of 2GB which is a must for this kind of specifications. S4 comes with a 13 MP primary camera, a 2 MP secondary. The Price Difference between the 2 models is approximately 200$ so you have to decide what you want to buy between the 2 depending on your price range and the features which you would like in it. Connectivity Bluetooth v4.0 with A2DP, EDR, LE, microUSB v2.0 (MHL), USB On-the-go, USB Host, Wi-Fi 802.11 a/b/g/n/ac, dual-band, DLNA, Wi-Fi Direct, Wi-Fi hotspot WiFi a/b/g/n, WiFi HT40, GPS/GLONASS, NFC, Bluetooth 4.0(LE), microUSB v2.0, USB On-the-go, wireless charging. Data GPRS, EDGE, WLAN, Bluetooth, USB, NFC, Infrared port. GPRS, EDGE, WLAN, Bluetooth, NFC and USB. Primary Camera 13 MP, 4128 x 3096 pixels, autofocus, LED flash 8 megapixel Auto Focus camera with Flash & Zero Shutter Lag, BSI. Video 1080p@30fps HD video 1080p@30fps, zero shutter lag. Camera Features Dual camera, sound & shot, drama shot, group play, story album, simultaneous HD video and image recording, geo-tagging, touch focus, face and smile detection, image stabilization, HDR, Cinema Photo, Eraser mode Simultaneous HD video and image recording, geo-tagging, touch focus, face and smile detection, image stabilization. Burst shot & Best photo, Recording snapshot, HDR. 4G Network LTE availability depends on the market. LTE availability depends on the market.